The Italian Renaissance Francisca Dress features elegant open sleeves that extend to the floor. Handcrafted, this historic dress gives off the appearance of a layered outfit while truly consisting of one easy to wear piece. 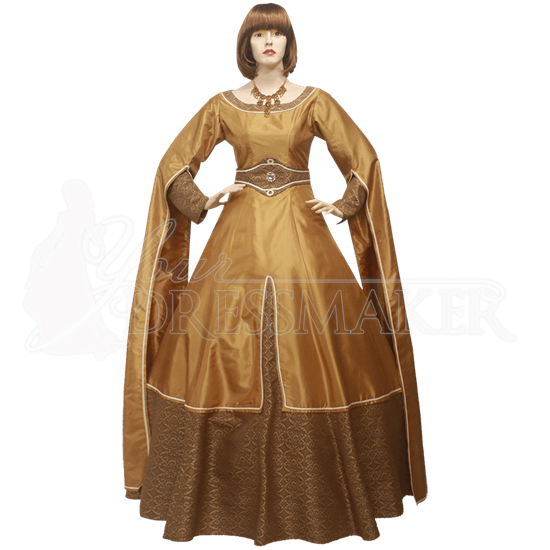 This Renaissance reenactment dress is fashioned to appear as though its golden colored taffeta is layered over matching damask patterned brocade which peaks out at the rounded collar, bottom half of the skirt, and on the fitted inner sleeves underneath the decorative hanging sleeves. Lace-up and belt details tie at the back to cinch the bodice of this dress. To showcase the skirts volume, as seen here, wear it with one of our petticoats, sold separately. The jewelry pictured is not included.